Occipital condyle syndrome (OCS) is a rare cause of pain in the head which is characterized by severe and persistent unilateral suboccipital headache with unilateral hypoglossal nerve palsy. Symptoms are usually worsened by rotating the head to the nonpainful side. The pain is usually simultaneous or antedated by symptoms of hypoglossal nerve palsy. 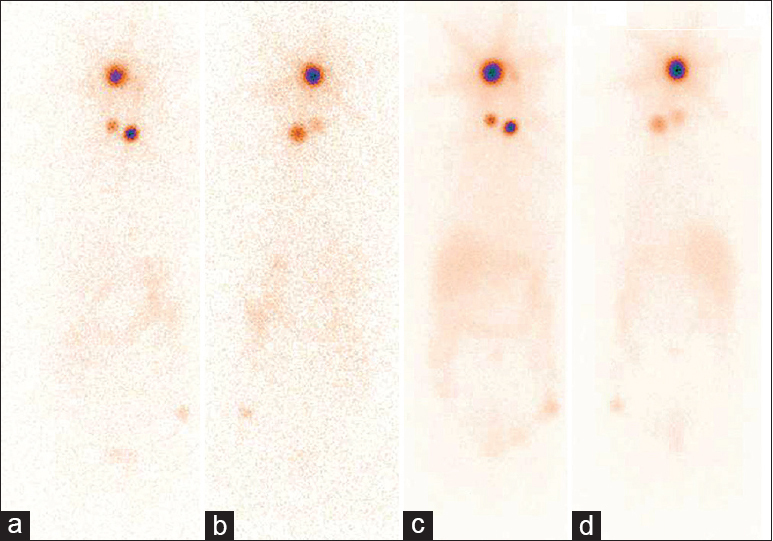 We present a case of isolated bone metastases from differentiated thyroid cancer-causing OCS. Multimodal management of the condition in our patient is also highlighted. A 71-year-old female presented to neurology department with a history of severe pain in the right side posterior aspect of the head for 2 months' duration. The pain was gradually increasing is intensity. She also complained of slurring of speech. She was a known case of diabetes mellitus on treatment for the past 10 years. On examination, there was slight deviation of the tongue to the left side with fasciculations. There was also a neck swelling which moved with deglutition. Fine-needle aspiration cytology of the neck swelling showed colloid goiter. She was advised magnetic resonance imaging (MRI) of the brain for evaluation of headache. MRI showed altered signal intensity with a lytic lesion in the right condyle of the occipital bone. 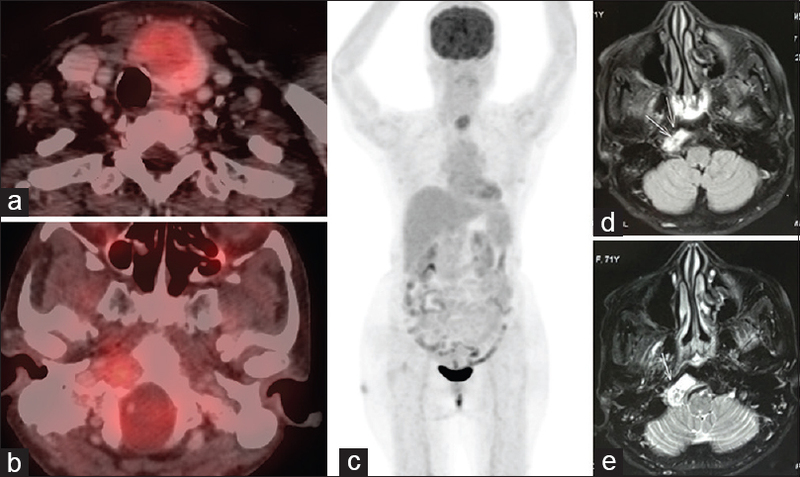 Neoplastic etiology was suspected, and the patient was subjected to a whole body fluorodeoxyglucose (FDG) positron emission tomography-computed tomography (PET-CT). FDG PET-CT [Figure 1] showed a metabolically active lytic lesion with minimal soft tissue (21 mm × 16 mm) in the right condyle of the occipital bone. In addition, there was a metabolically active hypoenhancing soft-tissue lesion in the left lobe of thyroid gland measuring (21 mm × 27 mm). No other metabolically active lesion was noted in rest of the organs. The patient underwent total thyroidectomy subsequently which confirmed the presence of 3.5 cm × 3.3 cm sized follicular variant of papillary thyroid cancer. The patient was referred for radioiodine ablation of the metastases. In view of significant pain in the head, radiotherapy to the metastatic site was planned before radioiodine therapy, and she received 30 Gy in ten fractions. 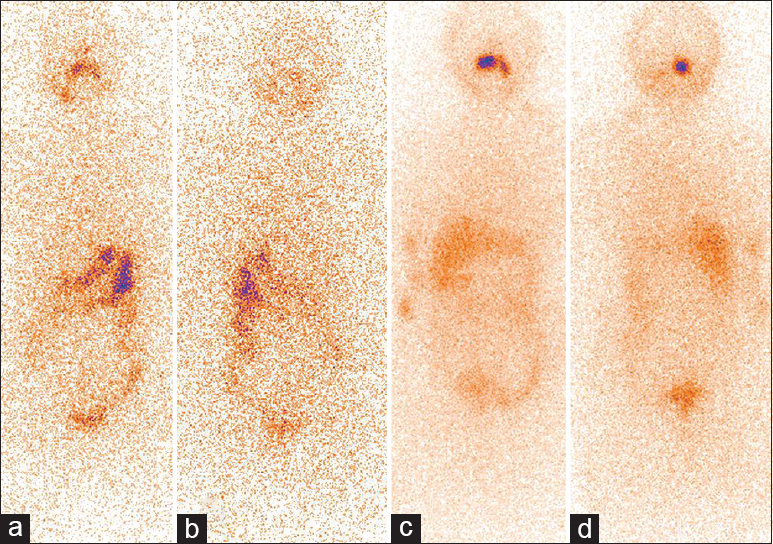 Whole body iodine scan [Figure 2] performed as per routine protocol, after 15 days of external beam radiotherapy, showed thyroid remnant with an iodine-avid osseous lesion in the occipital bone. No other distant metastases were made out. Her preablative stimulated thyroglobulin level was 203.33 ng/ml. She received 193 mCi of iodine-131. She, presently, is free of pain and her unstimulated thyroglobulin level after 3 months of radioiodine therapy was 0.95 ng/ml. She continued to be on follow-up with complaints of worsening dysarthria and deviation of the tongue to the left side. Repeat MRI [Figure 2] (at 5 months after radioactive iodine treatment) showed residual lytic lesion in the right side of skull base extending to the hypoglossal canal with engulfment of the hypoglossal nerve. There was the fatty replacement of the right half of the tongue indicating denervation atrophy. Neurology opinion was obtained for considering steroid treatment but was advised conservative management. She underwent a repeat whole body iodine scan at 6 months which showed minimal iodine uptake in the occipital condyle [Figure 3]. Her stimulated thyroglobulin level had reduced to 8.4 ng/ml. She received another 150 mCi iodine-131 and is asymptomatic on follow-up. OCS, first recognized by Greenberg, consists of unilateral pain in the occipital region along with an ipsilateral paresis of the hypoglossal nerve. The 12th cranial nerve arises from the motor nucleus in medulla, exits the base of the skull through the hypoglossal canal in the occipital bone; it then traverses the neck and innervates the tongue muscles. There is associated with neck stiffness and occipital tenderness which is typically worsened by neck flexion and rotation to the opposite side. Pain is relieved by neck movement to the same side. Pain often precedes hypoglossal nerve palsy. Skull-base metastases and primary head and neck tumors are commonly associated with OCS with malignancy being the cause in up to half of the patients  A wide variety of malignancies can cause OCS, including metastases from solid tumors of the breast, lung, prostate, and gastrointestinal tract, as well as primary pharyngeal tumors and lymphoma. Only, a small fraction of patients with OCS has a benign cause for their symptoms. OCS due to thyroid cancer has been previously described. The treatment of OCS is challenging. Complete surgical resection is often difficult because of the presence of adjacent vital structures (brainstem, cochlea, and cranial nerves), cerebrospinal fluid leak, and bleeding. No previous study has published the efficacy of iodine therapy in thyroid cancer metastases in patients with OCS. In our index case, there was significant improvement with near complete response to the first dose of iodine therapy. For unresectable and residual tumors, radiation therapy is feasible option. Radiation therapy provides a significant reduction in pain as was the case with our patient. With newer techniques such as intensity-modulated radiation therapy (IMRT), it is now possible to deliver a high dose to the tumor with minimum side effects to normal tissues. Multimodality treatment of surgery (total thyroidectomy), IMRT (for pain relief), and high-dose radiation therapy (for treating metastases) has provided excellent results in our index case. Keane JR. Twelfth-nerve palsy. Analysis of 100 cases. Arch Neurol 1996;53:561-6. Bahl A, Suresh P, Talwar V, Doval DC. Occipital condyle syndrome as a rare metastatic presentation of small cell lung carcinoma. Neurol India 2010;58:666-8. Chacon G, Alexandraki I, Palacio C. Occipital condyle syndrome guiding diagnosis to metastatic prostate cancer. South Med J 2006;99:898-9. Marruecos J, Conill C, Valduvieco I, Vargas M, Berenguer J, Maurel J, et al. Occipital condyle syndrome secondary to bone metastases from rectal cancer. Clin Transl Oncol 2008;10:58-60. Laigle-Donadey F, Taillibert S, Martin-Duverneuil N, Hildebrand J, Delattre JY. Skull-base metastases. J Neurooncol 2005;75:63-9. Tunio MA, Al Asiri M, Al-Qahtani KH, Aldandan S, Riaz K, Bayoumi Y, et al. Skull base metastasis from papillary thyroid carcinoma: A report of three cases. Int Med Case Rep J 2015;8:127-31.